The paper examines the basis of interactions of firms in rebana and metal cluster. The frequent interaction of the firms which are used to gather access to economic resources on the basis of relations within kinship, family, and familiarity, is defined as social capital. 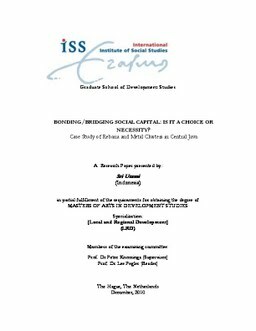 The basis of the interaction is differentiated into bonding and bridging social capital. The study focuses on the basis of interactions of firms which are mostly taken by the artisans to access economic resources. The study found that bonding social capital route is the route mostly taken by firms. Moral obligations, kinship and family systems, norms, values, instability of market and the power of the leading actors are the reasons why the clusters take the strong ties. It is found that maintaining these strong ties is the useful approach for small artisans to survive because of their lack of capability to be independent. However, building wider relationships with other different background of people such as global buyers, and different group or organizations are a need for the leading firms that mostly have the capacity. It is concluded that bonding social capital needs to be maintained as the first approach of small firms to gather easier access for economic resources. Meanwhile, it needs to be actualized to trigger wider interactions with other partners for the benefit of the firms.